At this year’s Asia Fruit Logistica event, Consorzio Italiano Vivaisti (CIV) successfully showcased a range of new apple, pear and strawberry varieties. 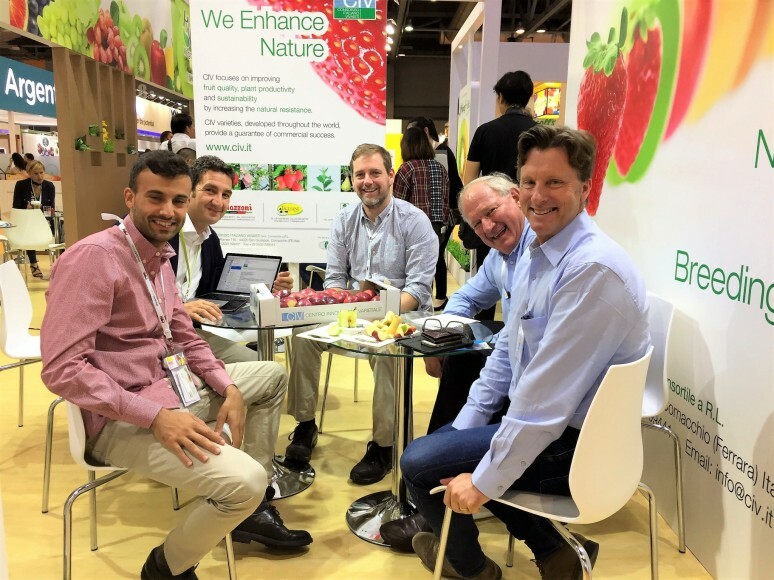 CIV’s president Pier Filippo Tagliani said that Asia Fruit Logistica is “the Asian landmark event dedicated to the fruit and vegetable sector,” and an important forum for exchanging ideas or forging contracts. The company is currently developing a number of new apple, pear and strawberry selections in eastern Asia suited specifically to certain climates, and with in-built disease resistant traits. Apple varieties displayed include Sweet Resistants apples, Gaia, Gemini, Fujio, and the Civg198/Modi. Strawberries like the Flavia, Flaminia, Cler, Murano and Majestic; and pears Lucy Sweet, Early Guilia, and Lucy Red were on show. During the show, CIV said Tagliani and variety manager Marco Bertolazzi met with international partners to discuss current and future collaborations with a focus on territories in eastern Asia, a region which the company believes holds interesting development opportunities.